As June draws to an end, I am yet again in a new location. The transitions have their ups and downs and for the most part are never dull. June has been our month to relax and rest from a busy year. May was filled with traveling back to America, settling back in, and finishing up school with W and D. Our last week of May was crammed full of end of the year tests and completing research papers. June began with the kids and I driving to Texas to meet up with my husband. It was a fun month not only spending time with my husband but also getting time with friends and eating way too much good food. This month I have been challenged, entertained and tested. Hopefully I can put some of this into words as I write about what I have learned the month. 1. Intentional communication works. My husband and I were apart for most of the month of May. He stayed back in Central Asia to continue flying while I brought the kids back to the states. We were apart for a month last Fall, and it was hard. We didn't communicate well. When we came back together, it took some work and time to get back where we wanted to be. This separation was better. I told my husband that my one expectation was that he would communicate once a day either by email, Skype or Facebook. I understand he doesn't have time to talk everyday, but I like to know that he has thought of me and that he is okay. So even an email that says just "love you" would be fine. I was also more intentional in keeping him updated by email and in our talks about what was going on with me and the kids. On my part, I was more intentional in encouraging him and letting him know how I appreciated all that he is doing both for our family and our organisation. This is something I need to do more even we are in the same location. I heard from him most every day and that small connection made a big difference. 2. Being a guest is hard. If someone has a guidebook, let me know. Everywhere we have stayed, the hosts have been so gracious and kind. Not being in your own home can sometimes make it harder to relax. You have to be flexible, and sometimes it is hard to know when your hosts are enjoying the time with you and when to give them more space. How much should you help? Figuring out that balance can be hard at times. I am so thankful for the people we have stayed with. In each location, they have opened up their homes willingly and shared their lives with us. God has given us such great friends and family. We are blessed. 3. AP Calculus training was engaging, exciting and enjoyable. While in Texas, I was able to spend 4 days, a total of 30 hours, learning how to teach AP Calculus. The teacher had 30 years of experience and many practical ideas to use in my classroom next year. I even received 3 new textbooks to use as resources. I now feel like I have a head start on my lesson planning for the next school year. On a fun side note, I ended up sitting by a gal who will be teaching at a sister school in South Korea. We had each signed up for the class separately and on our own. What made it even more interesting is that her new director was my director last year. 4. Going to a Water park with my husband on our anniversary was a great experience. We celebrated our 22nd anniversary this year. The day of our anniversary was the only day open for us to take the kids to a water park. We met up with a couple we work with overseas. The kids went off on their own, and we enjoyed a day talking and riding the rides with our friends. The time waiting in line gave us lots of time to talk together. By the end of the day, I felt like a drowned rat, but it was worth it. In the evening, we went out to a restaurant minus the kids. So we had a good balance of fun and romance. 5. My husband does hear hints that I toss his way. 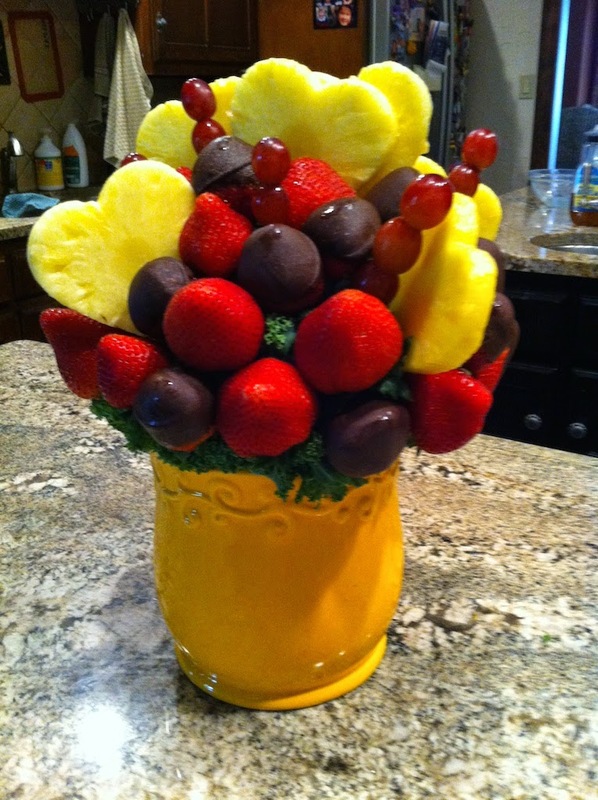 For our anniversary, he gave me this fruit bouquet. It was yummy, and I can reuse the vase. Most of all, I was touched by his thoughtfulness especially since I didn't even buy him a card. Our daughter thought her daddy was very romantic. 6. Buying a plane ticket to see teammates in Phoenix was money well spent. This month I spent almost 5 days in Phoenix with two other wives. Their husbands are also rotating in and out of our country to keep our flights going. I have known these two from the beginning. We struggled through language together, and I am an honorary aunt to their children. It was a blessing to reconnect and share our hearts. I enjoyed getting to know their kids better and being a second pair of eyes and hands since Dad is overseas. 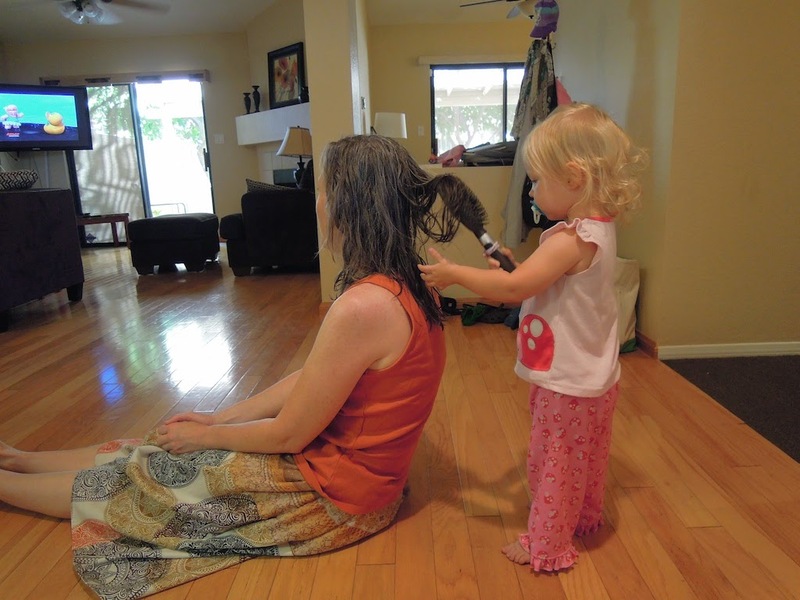 Here is a picture of my little beautician helping me get ready one morning. I came away from our time encouraged and with many new fun memories. 7. This time in the states has been a great chance for my daughter W. to test her wings. She has had opportunities to drive places on her own and be a bit more independent. Our latest adventure was going with her brother to a place they had never been using a GPS. They did great and had a good time. I am thankful for W's love of life and confidence in who God has made her to be. 8. I am still thankful for the college roommate God gave me 27 years ago. This past weekend was spent with my roommate and her family. She worked on the yearbook. I ran track. She loves staying up late. I am a morning person. In spite of what might look like big opposites, we have lots in common-a love for God, a love for reading, great memories, and history. It was good to reconnect again. Even though I don't stay in touch like I should, we always seem to just pick up where we left off.